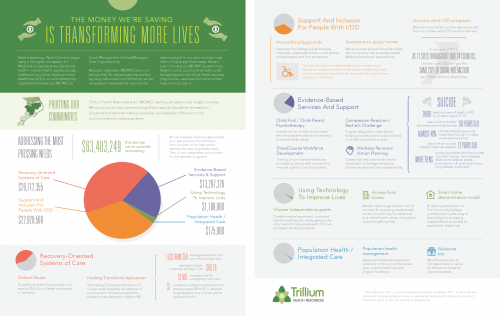 By managing Medicaid funding and services locally, Trillium has been able to achieve cost efficiencies that allow us to reinvest savings in innovative programs and services that are making a difference in the communities we serve. The Board and management of Trillium Health Resources have developed and are implementing a robust plan to reinvest the savings that the organization has achieved in projects that address the most pressing needs of the people and communities we serve. We are proud to have generated significant savings that we've reinvested in programs and services making a positive, unmistakable difference to the communities and citizens we serve.This is our plan to reinvest $63,403,249.00 to our stakeholders and the public. Click on the image below to see how we are investing our savings or watch the video to know more about our services and how we are reinvesting in our communities.